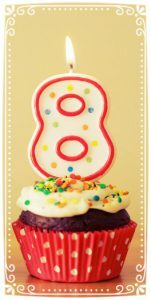 It’s our 8th Birthday today! 8 years ago today I left a great job selling television advertising for ABC to start an advertising agency. It was 2008, during th e Obama presidential election and start of the Great Recession. It was a big leap of faith that paid off. I’m so thankful for the great team of people I have had supporting me and cheering me on as I’ve built Thrive into the company that it is today. Thank you to my loyal clients who have allowed me to serve them year in and year out, to my media reps who work hard to give my clients the best values, to my employees (past and present) who work(ed) to build this business, to my network of collaborators who inspire me and support me in my entrepreneurial dreams and to my family for being my biggest cheerleaders. I’m so grateful to be running a business that I love, with clients that are wonderful. Happy 8th Birthday Thrive!